Biography Biodata and Profile Yos Sudarso national hero Just share to increase science We are the heroes who had liberated the nation berjara Indonesia to date, this time with Biodata Yos Sudarso national hero. to know more and more to know please refer Profile Yos Sudarso national hero. but no information about him long. Yos Sudarso names very closely in the memories of the Indonesian nation in the struggle for West Papua from Dutch colonial hands. After negotiations KMB West Irian was still under Dutch colonialism. As the region in the archipelago, West Irian fought tooth and nail by the Indonesian confrontation either through diplomacy or politics, economy and military. The highlight of West Irian struggle through the orders of President Sukarno in a speech which is known as Trikora (tri commando people). Follow-up of Trikora Mandala is the establishment of command and military confrontation. In a military confrontation in the Sea Arafuru, Vice Admiral YIS Sudarso fall after bombardment KRI Leopard in the Netherlands. 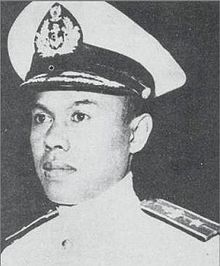 Vice Admiral Yosaphat Soedarso (born in Salatiga, Central Java, 24 November 1925 - died in the Aru Sea, January 13, 1962 at the age of 36 years) is an Indonesian national hero. He died on the KRI Leopard in the Aru Sea battle against the Dutch fleet during the campaign Trikora. It is less common, as the Chief of Naval Staff he should not participate directly in the operation. His name is now immortalized on a KRI and the island.